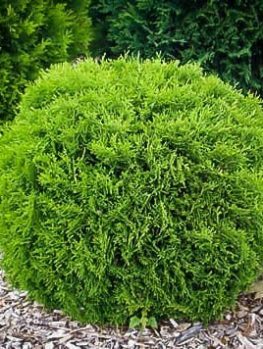 Everybody loves evergreen bushes that form neat, round globes without needing clipping and that never get too large. When such a useful plant is also colorful and interesting all year round, it is a real find for any garden. Add that it also survives in even the coldest areas of the country and now you have the perfect choice. The Fire Chief Arborvitae is such a plant – tough, hardy, evergreen, always neat and round, never too big, but best of all, covered all year in a fascinating glow of bronzy-red, which intensifies and reddens more as the cooler weather of fall arrives. 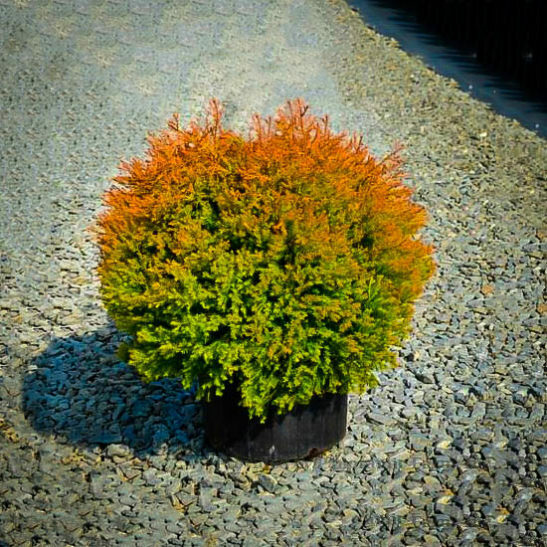 This novel new color in Arborvitae, which are normally green, or sometimes yellow, adds a great sparkle to your planting, without adding any work. It will grow steadily into a globe two feet across and the same width, and eventually into a plant perhaps 4 feet by 4 feet. It is the idea size to fit perfectly into any part of your garden. 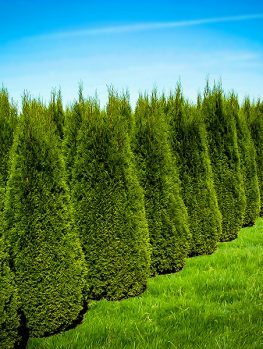 This variety of arborvitae is hardy in even the coldest parts of America, and it can be planted in a sunny location in ordinary garden soil. Like all arborvitae, it benefits from a regular supply of water, but once established plants are resistant to ordinary summer dryness, so they need no extra work. It is pest and disease free, so it will always look great in your garden. 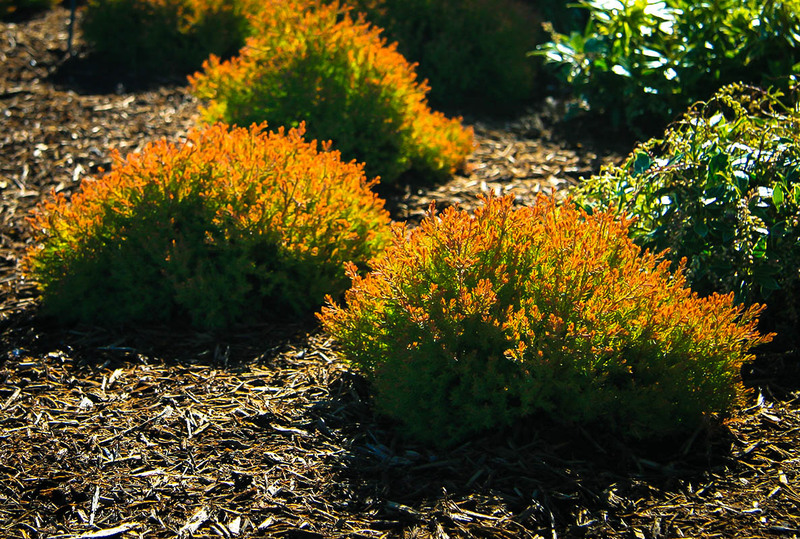 To add terrific color all year round without adding work, the Fire Chief Arborvitae is your top choice. When gardening in cold areas, choices can be restricted. This is very true when it comes to evergreens, since so many can burn and become blacked in intense cold. So when we find a great new plant that is super-hardy, and colorful too, we are going to sing about it. The Fire Chief Arborvitae is a wonderful addition to our range of evergreens, because it brings color at all seasons, and brightens up your garden every day of the year. 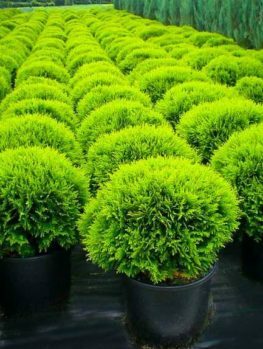 It forms a perfect globe of soft foliage that stays neat without any clipping. Soon growing to a comfortable size of 2 feet in all directions, it will eventually reach as much as 4 feet tall and wide, but you can clip it to almost any size. What makes this plant stand out is the wonderful red coloring that suffuses the new growth and stays all year round. In fact, as fall arrives, the soft red of the summer changes into a more intense red, that lasts all winter. When the snow comes, it glows like a warm candle in your garden. It will never blacken or die in the coldest weather, and always add interest and color all year round. 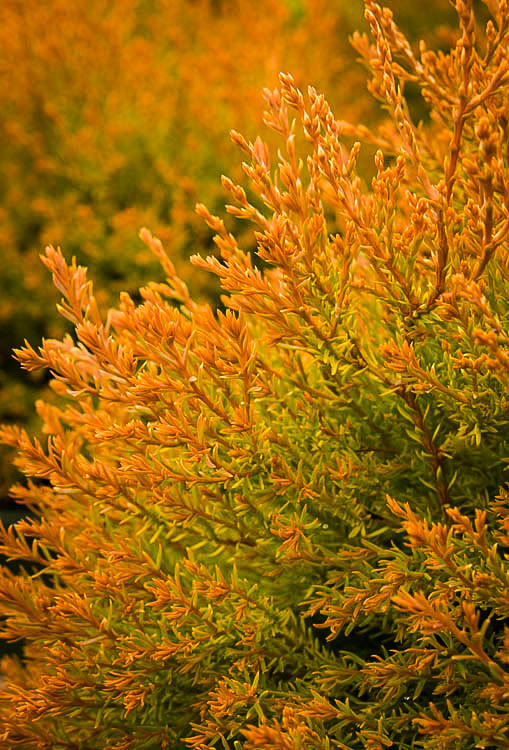 Use the Fire Chief Arborvitae as part of the foundation planting around your house. It can be planted as a single specimen or as a group of three or even more. Clustered among taller plants, it makes a great shape-contrast to their more upright form. It also works well in your flowerbeds, or in shrub beds all around your garden, adding year-round color. Even the smallest garden has room for this lovely plant, which asks nothing of you to stay beautiful. It is also a great plant to put in containers or planter boxes, where it gives structure and permanence among the temporary flowers you might plant for summer. To get the best color, plant your Fire Chief Arborvitae in a sunny spot. It will grow happily in average to moist soil. Water it regularly during dry weather for the first few years, but once established it will handle normal summer dry periods with no problem. It has no significant pests or diseases. 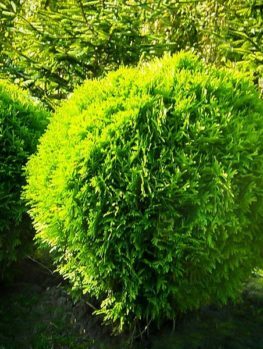 In several years, your bush will be a robust 2 feet tall and 2 feet across, naturally growing into a perfect globe. If you enjoy clipping your plants for the neatest possible garden, a light clipping in spring before the new growth begins will give you a solid globe, or any rounded shape you want. Like all evergreens, it will continue to grow steadily, and should mature at around 4 feet by 4 feet. Of course, it can be clipped as it grows to keep it shorter, if that is what you need. 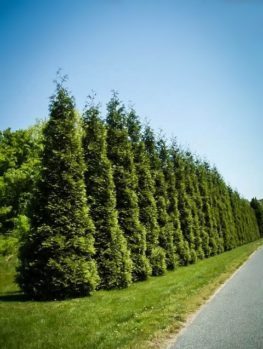 American Arborvitae (Thuja occidentalis) is a small tree growing to perhaps 60 feet tall, native to southeastern Canada and the northeastern USA. It has soft, scale-like leaves pressed on the stems which in turn are arranged in sprays. Wild trees have an open habit, but gardeners have selected varieties that are dense and either upright or rounded. 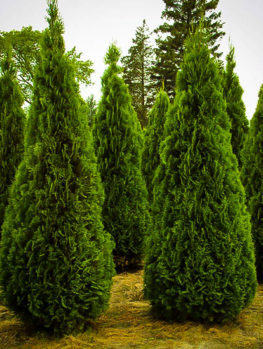 A nurseryman named Gabriel Cesarini found the Fire Chief Arborvitae at a nursery in New York State. He spotted a brilliantly colored branch on a golden arborvitae called ‘Rheingold’. Realizing how useful that coloring would be in gardens, he grew plants from it and in 2007 he named it Fire Chief, perhaps because it looked like it was on fire. The red tips create a rosy glow around the plant, and only turn green after new red shoots form, so your bush is always colorful. With its great coloring that never fades it makes a bright accent in your garden all year round. 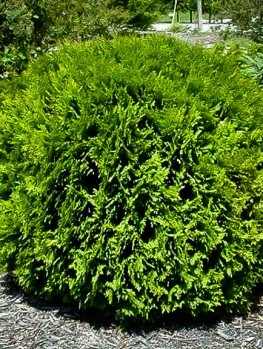 Such a special plant has to be carefully grown from original bushes, with all the correct qualities, and if it isn’t labeled Fire Chief it is not the globe arborvitae you want. All of our trees are grown the proper way, by our experienced and specialized staff. So, for a perfect round globe of glowing foliage in your garden all year round, the Fire Chief Arborvitae is the number one pick. This popular new variety is setting the garden world on fire, so order now to avoid disappointment, as our stocks will not last long.